I don’t know how else to describe it, gold and orange looks like the sky sometimes when the sun is about to set. 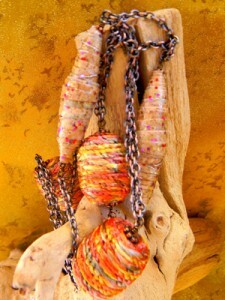 I love mixing yarn covered wood beads with paper beads, it solves the dilemma of “I don’t have beads that will go with these.” Barrel shaped wood beads are wrapped with multicolored yarn in hues of orange and yellow to go with gold paper beads from hand made paper. I especially made this bead to be long and wrapped silver threads around it and finished it with flecks of glitter. I made the bead Kayla designed the necklace. 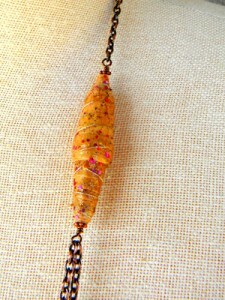 I thought it came out nice with the antiqued copper chains. Don’t you just feel so proud wearing something that you made? Including the beads, all made by you! How cool is that? Absolutely love them! How did you string them on and keep them on? I have not used any chains other than a leather cord and am wondering how to get different chains to work and stay on with spaces between the beads much like your beads look. Again, absolutely beautiful! ooohhh …!!! what a wonderful idea! These colors are fabulous, sunny and bright …. always new ideas every day! what work!!! Thank you Janice and Kayla ! 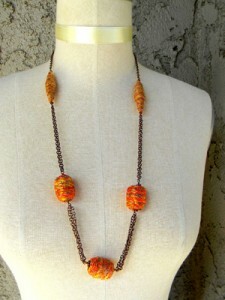 I love the texture of these beads! Beautiful and bright!